Another Olympics has come to an end. Did you watch? We are not a hockey family, but we watched Canada's women and then the men take gold, cheering the whole time (even though the boys kept calling the periods 'ends' after watching a few curling matches!). Even when we weren't watching specific events, we were constantly checking the medal standings to see how Canadians were doing. Can you imagine yourself at the Olympics, about to compete? How much time and energy would you have spent getting ready for that moment? How much of yourself would you pour into your event? Wouldn't you give every ounce of skill, every bit of energy and will you could muster in pursuit of that gold medal? Consider now how you apply yourself to the more ordinary things God has called you to do. I have always wanted to be a writer; I believe God designed me for this purpose. How often do I actually write? Before I started this blog, with its commitment to a Monday devotion, I almost never wrote anything more significant than a grocery list. All my excuses could be summed up in one word - fear. Fear I wouldn't be good enough, fear that my words wouldn't make a difference. 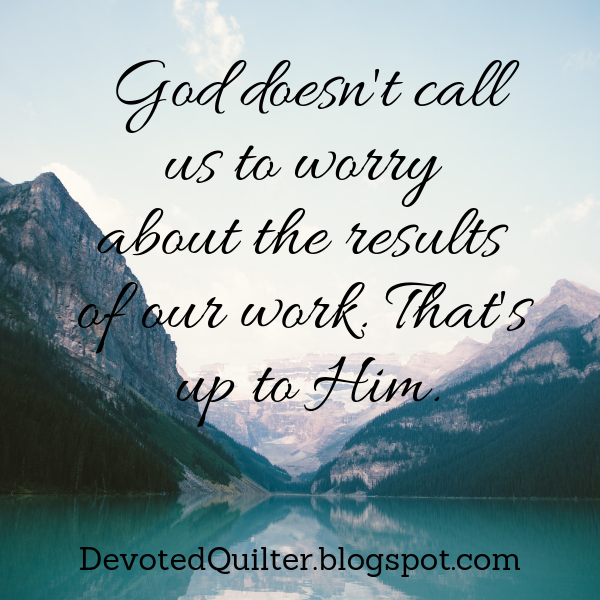 But God didn't call me to worry about the results of my work. Jesus said, "God's kingdom is like seed thrown on a field by a man who then goes to bed and forgets about it. The seed sprouts and grows - he has no idea how it happens" (Mark 4:26, MSG). The man can't do anything to make the seed grow except plant it. He can't coax the shoot out of the seed. He can't make it grow faster by pulling on the first speck of green that pokes out of the ground. He plants it. Whether or not it sprouts, whether or not it produces a harvest is largely out of his hands. There's only one guarantee: with no seed planted, there will be no harvest. My job is to be faithful, to pour myself into what God wants me to do, and to leave the rest to Him. It's just like the gymnast I wrote about last week. She throws the hoop into the air and continues on, putting all her energy into performing the next part of the routine. I will never answer to God for how you used your gifts or for the effort you put into what He called you to do. Neither will you answer for me. We will each be "rewarded according to [our] own labor" (1 Corinthians 3:8b). Olympic gold pales in comparison to the rewards God can give. So true Leanne. There is a French proverb saying "Qui ne tente rien, n'a rien", not that we will always have results, but the first step to success/accomplishment is to try.